As soon as I came across sketchnoting I knew it was suitable for language learning. How? Because I recognized that my own language learning notes were a form of sketchnotes. 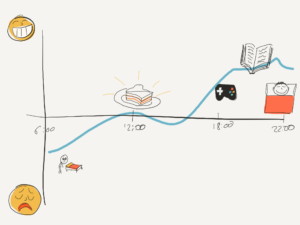 Instead of using only words, I used icons and diagrams as well as words. That was because I was encouraged not to use my first language in the classroom and instead seek to “think” in the second language. It made sense to aim for this in my notes as well, but there was an issue. I often couldn’t describe what a new word meant (try clearly and accurately describing a dog with very basic English vocabulary). Doodles and visuals helped to provide clarity in my notes and yet keep them focused in the target language. 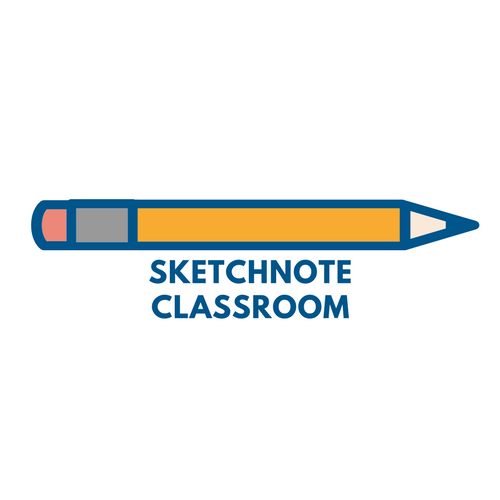 However, sketchnotes can be used for more than just recording vocabulary via flash cards. 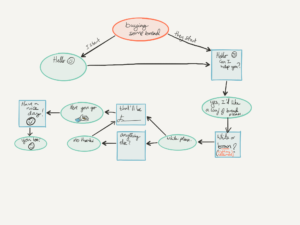 Here’s how to learn a language on your own with sketchnotes. In the Sketchnote workbook this is one of the ideas that Mike Rohde introduces. These are useful as you can have a clear visual representation of the word you are trying to learn (so its meaning is clear) and you can practice these words on the go via the principle of spaced repetition. 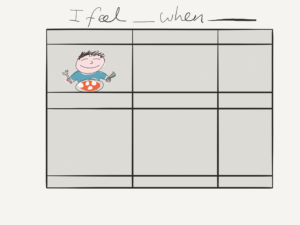 Sketching your own flashcards is very useful as it allows us to personalize our images and add in connections that we think. The process of creating the notes is also very powerful for helping to remember the target vocabulary. However, stopping with a single word is a real shame, but often what we do. Let’s take the word “dog” for example. I would probably draw a dog differently to how you would. Maybe yours would be a big German Shepherd, or perhaps a small Yorkshire terrier. Well, now we have some adjectives along with our noun. It could be as simple as “a small dog” or more complicated like a “cute bag-able dog” (when you have a dog in someone’s handbag). With verbs we can look at the grammar that goes along with them. “She’s playing football” for instance or “he wakes up at 9am everyday”. Focusing on “chunks of language” that frequently occur together helps take flash cards further than just a single word. 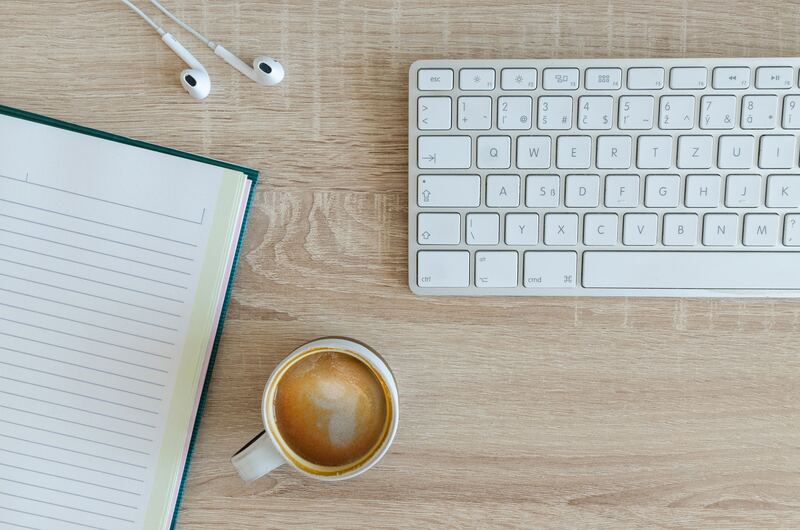 If you are self studying, you can then use your phone to record yourself talking about your week, save a picture and the audio together and you can keep track of your progress (or get feedback on how you are doing). You might also be able to show these notes to a more proficient speaker of the language and get their feedback on your errors. English is full of interesting idioms and phrasal verbs. It makes the language rich and beautiful, but also difficult to learn. The fact that their meaning is not obvious or tied to the parts that make them up, makes them difficult to understand and remember. With sketchnotes, we can use visual that highlight the actual meaning as well as the literal meaning. This can be useful to help remember words…plus pictures of people with feet in their mouths are fun. Most of this post has been focused on vocabulary but grammar is also important. Languages treat time differently and in some cases we need extra grammatical tenses or aspects to describe two things where we’d use the same one in English or our own language. That’s not even touching on cases in Slavic languages. 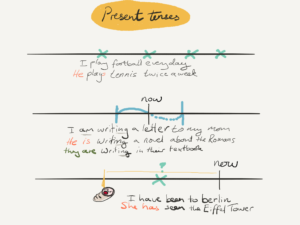 Timelines can be useful tools to help get to grips with tenses. The involve a line which represents time (including now, the past the future) and where we can show an action, whether it is a process, a finished action, a recurring action and so on. Cases aren’t a major problem in English (it’s only really the pronouns which can cause a problem) but in other languages (I’m looking at you Slavic languages), they can be a real headache. When it comes to cases, I have found using colour codes to be very useful. So if I write, “the boy is eating the apple” I might draw “the boy” in blue and “apple” in red and write those words in the same colour with bold for how the noun has changed form. That’s pretty simple, but when you add in adjectives in different cases, as well as indirect objects and locations, it can be more tricky and require more colours. Listening and reading practice can be enhanced by making a sketchnote to record what you are listening or reading. Simple follow along and make note of the key events and most important information. You might come across a new word, or hear an expression which you quote. Plus you’ve then got a record of the big things picture and plot which you can refer back to, this can help you understand what is going on at that moment from the bigger picture (top down processing skills). Here’s some examples of Doug Neil learning Spanish form a film. One of the things I used to do in Ukraine was try to anticipate interactions I’d have that day. So if I knew I needed to buy something in the pharmacist, I’d think through my conversation trying to anticipate their questions. Likewise, when I was meeting a friend, I’d try to do the same. The problem is that often I’d think “what if they say this…or they might say THAT”. Decision trees are a great way to build in these different routes a dialogue could take and help you think through your interaction. You can then add to them as you find out what really happens. Of course, if you like sketchnoting then you can use that interest to spur on your language learning. Find someone who makes sketchnotes in that language, find books on sketchnotes in that language. There can be issues with the type of language that people include in sketchnotes (it might not match up with the type of language people speak) but being aware of that will help, and maybe they can help guide you through the primary source? Find a TED talk, someone’s sketchnote for it and then follow. 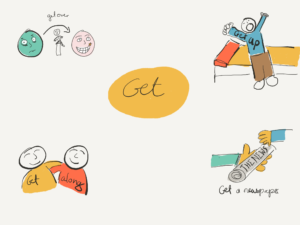 I started this post because I had been researching this topic for my IATEFL talk on using sketchnote or visual notetaking in the young learner classroom and it surprised me how many posts there are online which go “get your students to sketchnote kbaithnx”. Hopefully these give you some more ideas which you can use to teach others or use yourself (and you can expect more to come). Have you got any other ideas? This is really interesting. I am studying Polish right now and was looking for a good and entertaining method, learning everyday. Since I also have taken up sketchnotes since a couple of months, this is a really good exercise for both of the subjects. I totally agree Claudia and I think it’s a way to make sure you do both. You tie a new action you want to do, with one you already do. Win Win.